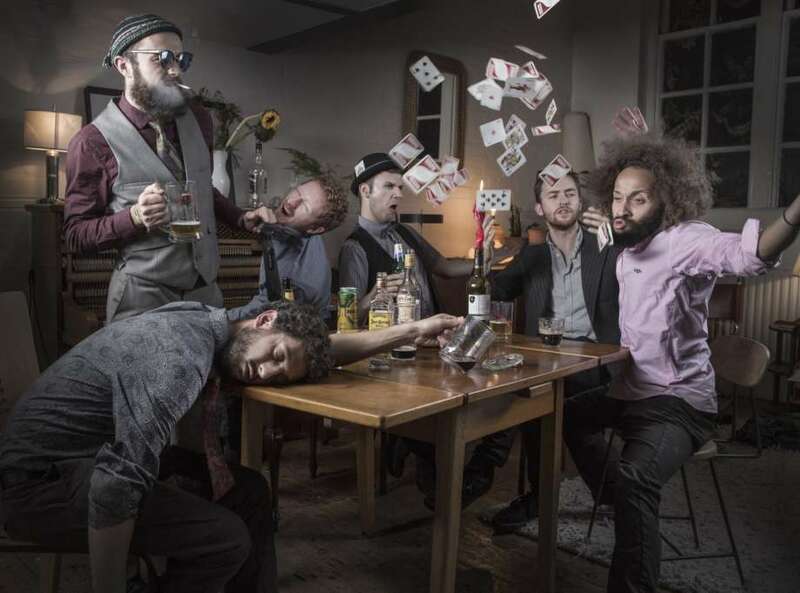 Over the last few years, Leeds based klezmer/Balkan beats/gypsy jazz bohemians Tantz have taken the UK world/roots music scene apart with their full-on musical attack on audiences across the length and breadth of this nation. With awesome musical chops, an energy not seen since punk rock’s halcyon days and ability to turn a gentle world music festival crowd into a heaving, pogoing mosh-pit, there’s something special about this band that manages to touch almost everyone who hears and sees them live, no matter what music they’re into. Formed at the Leeds College of Music by mates to play the music they all loved – klezmer, gypsy jazz, Balkan music – at small venues in the city, they soon built up a loyal local following. A Tantz gig was not just a gig, it was a party. As they ventured further afield and word spread about them, the band’s sound evolved over the years into this roaring blend of the traditional and the new that has seen them working non-stop at all kinds of events. World music festivals like WOMAD, rock/electronic gatherings like Bestival and Kendall Calling, club nights like Balkanarama and Soul Rebels. They even played at the Brit Awards After Party 2014. The great thing is they rock every gig like it’s their last one. Bottle of rum onstage, “1-2-3-4, let’s go” count and they’re off. Then it’s a 90-minute ride of pure musical maelstrom that encompasses thumping bass lines, frenetic violin fiddling, in-yer-face drums and percussion, ska-punk chopped guitar and stratospheric soaring clarinet solos played so fast Charlie Parker would be proud of them.